Works with devices using the Micro USB connector. Cable mounted weatherproof in-line regulator assures the voltage is properly stepped down to operate the device. Fused Battery Harness is 60" long. Great for Android devices! Powerlet's line of micro-USB power cables are tough, dependable and built for powersport activity. Glove-friendly design insures ease of connection and use. Small size enables easy storage. Works with stock sockets found on BMW, Ducati, Aprilia, Triumph, Moto Guzzi and Victory motorcycles. 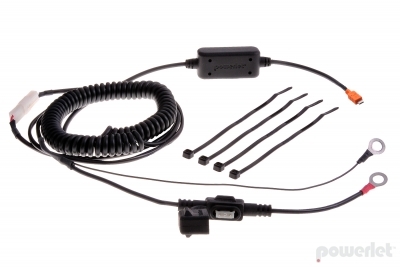 Offered in a variety of lengths including a direct to battery harness. Motorcycles, Snowmobiles and ATV's create a demanding environment for enjoying your todays electronics. The connection to the vehicle electrical system needs to be secure yet have the ability to easily disconnect when required. Designed to not vibrate out, Powerlet cables exceed vibration, size, and current (amperage) requirements while promoting effective cable management. Our engineers make sure the mini- and micro-USB connectors are compatible, fuses are sized correctly and that voltage is properly regulated down to +5VDC for safe operation. Powerlet's quality power cables are built to last a lifetime and priced to not break your wallet.